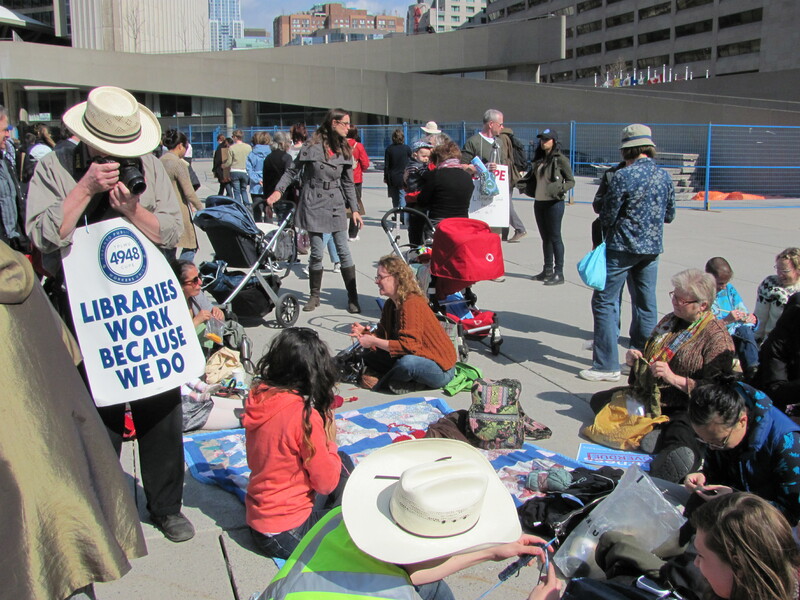 The Knit-In at Nathan Phillips Square in support of Toronto Public Library workers was a HUGE success. Thank you so much to everyone who came out. 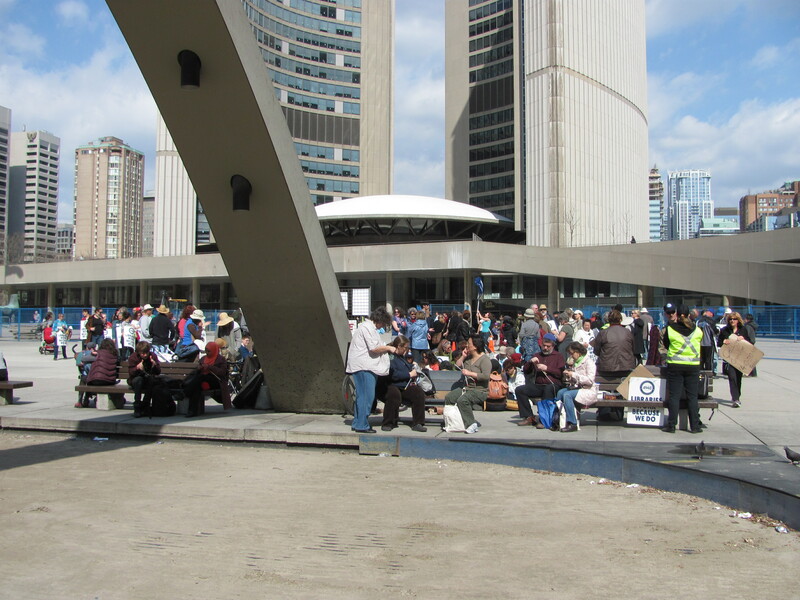 Some estimates pegged the number of participants as high as 200! That’s a pretty sizable group for a weekday event held on only 2 days notice. 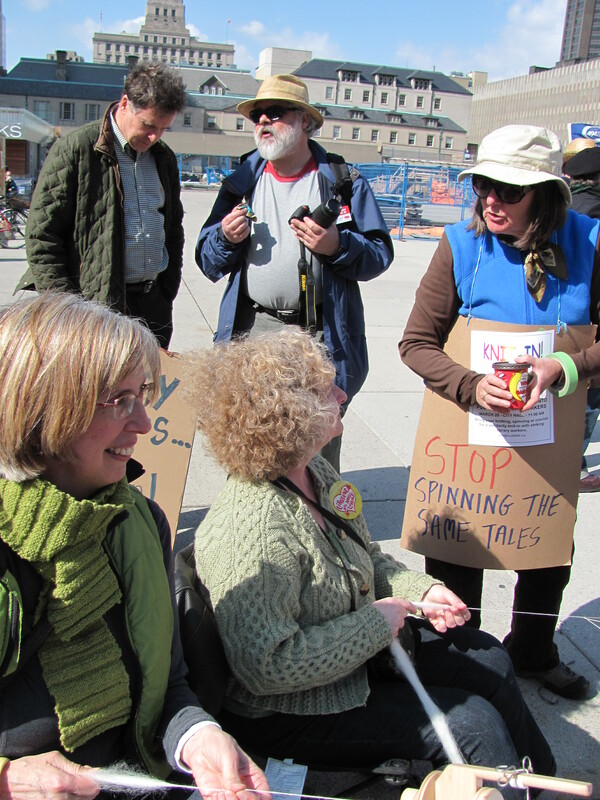 A special thanks to Wise Hilda, Kate Atherley, and the Yarn Harlot, Stephanie Pearl-McPhee, both of whom not only retweeted about the event but even came out to lend their support! I knew Kate was coming, and it was still awesome meeting her, but Stephanie was a surprise. I read her blog and have read all her books. I was star struck and ridiculously excited. I snapped this picture while I was still working up the nerve to talk to her. Then I moseyed on over to say hi and thank her for coming. Turns out she is really approachable and easy to talk to, which resulted in me running my mouth off and mentioning that I wish I’d brought a book for her to sign. Immediately after I left, the media descended on her. I’m hoping it’s not my fault because they overheard me indicate she’s famous… Sorry Stephanie! Margaret Atwood gave us a shout out on her Twitter as well. Matter of fact, it was the same day this article came out. First there was the Sun’s article featuring an image of yours truly. Glad they published that one and left this one to Twitter. It as windy out! I have a lot of hair! 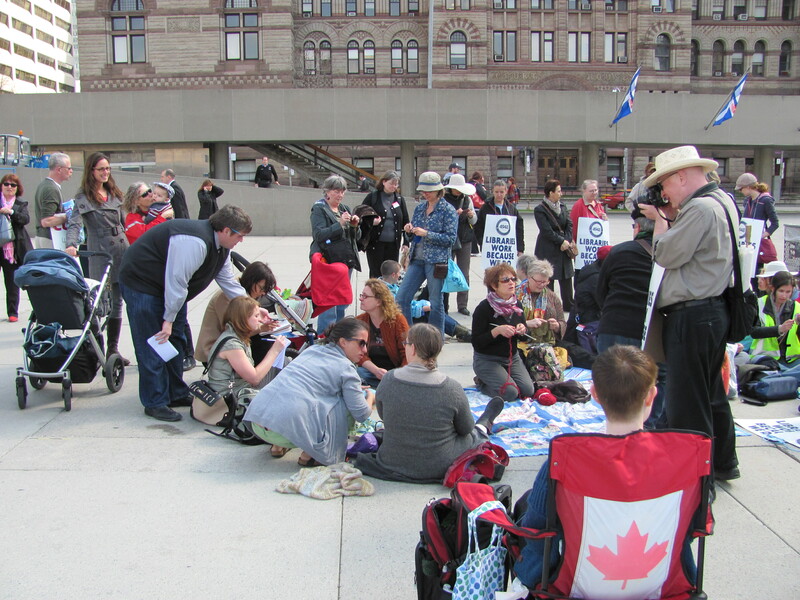 Then came the National Post’s coverage. And the Globe and Mail including this great pic in their Day in Photos section. We’re photo #7. 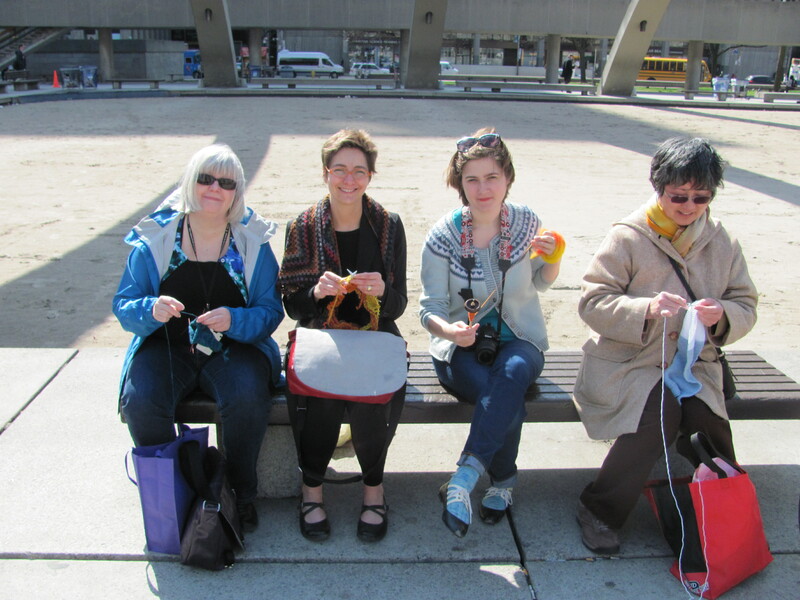 “… participants laid out blankets on the asphalt and brought tupperware containers filled with apples and other snacks as they knit together skirts and scarves” – this National Post statement, combined with The Sun‘s Twitter photo caption makes me think I should have chosen another knitting project, one less easily associated with librarian stereotypes perhaps. It’s not your Grandma’s skirt, I promise! And what’s with the focus on blankets and snacks? 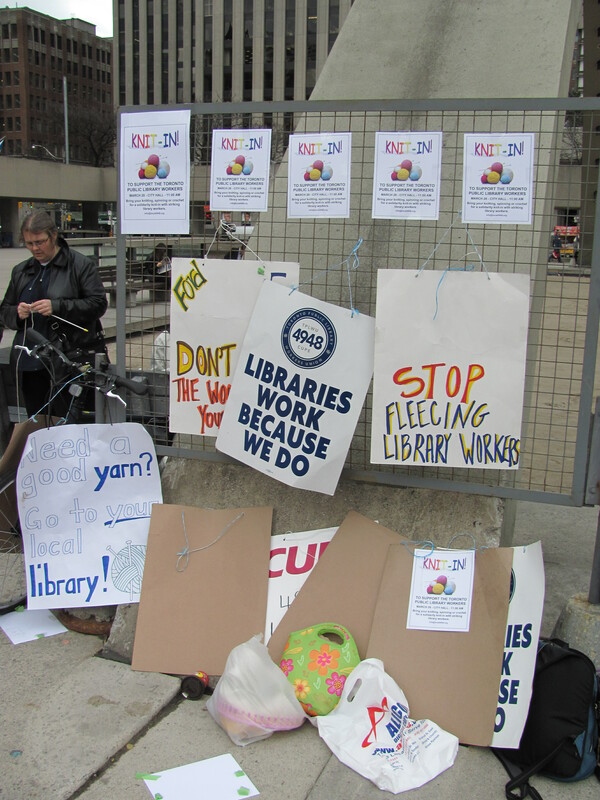 Another reporter also said on Twitter that “striking library workers are being adorable again.” Thanks for the sentiment, but I counteract with this quote by yours truly in the plug the Bissell Bombers did for us: knitting is “…part and parcel of the stereotype of librarians as dowdy, grandmotherly figures. 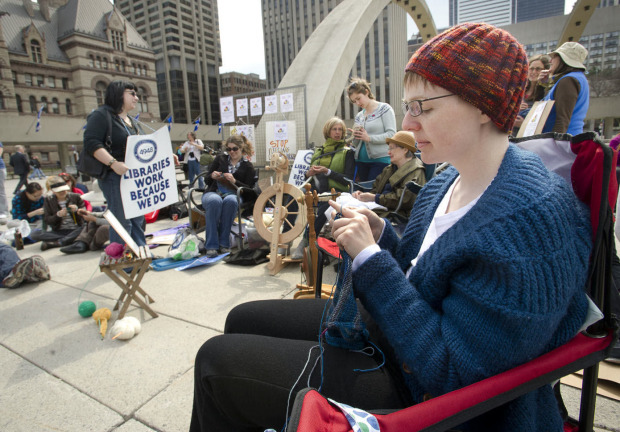 A Knit-In in support of a library both pokes light, tongue-in-cheek fun at this stereotype while simultaneously challenging it. 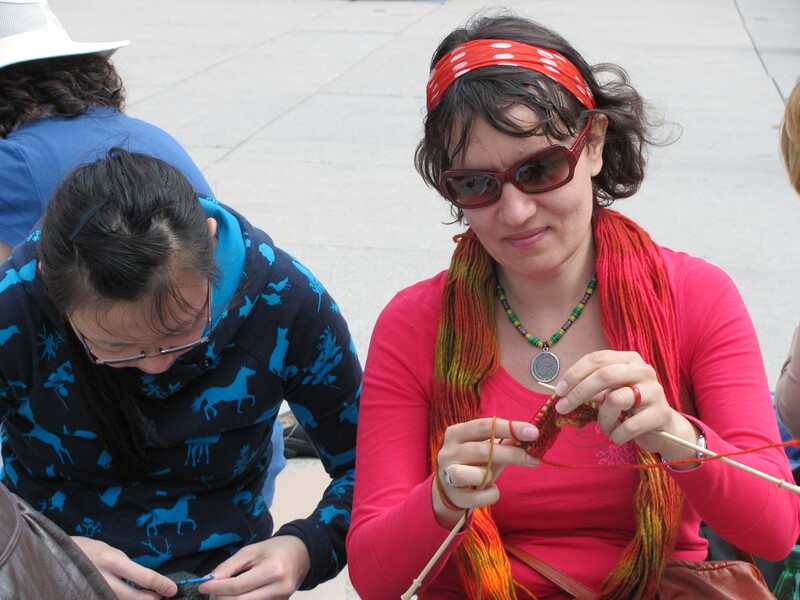 Today’s knitters are full of passion and vitality. 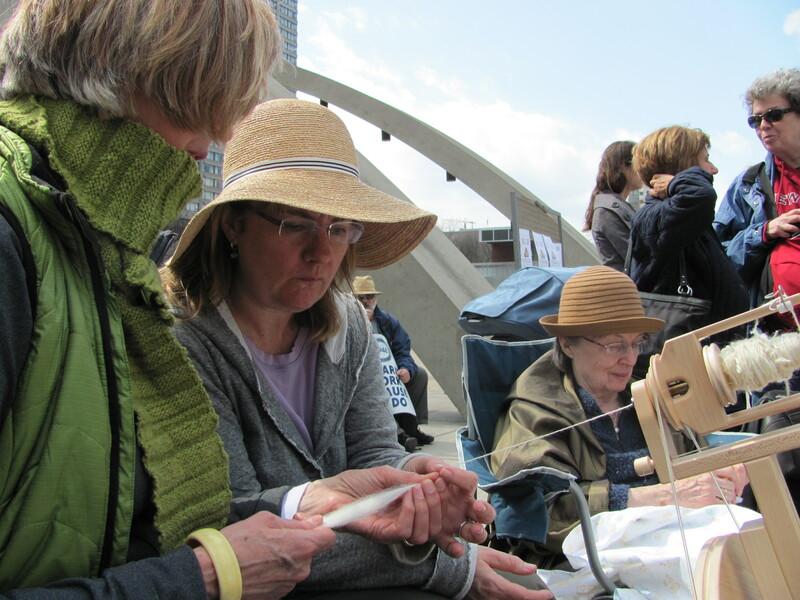 They choose to craft for the enjoyment of it and bring immense creativity to what they do. Such energy is a perfect fit for activist persuits, hence the rise of knit-ins and yarnbombings.” So there. 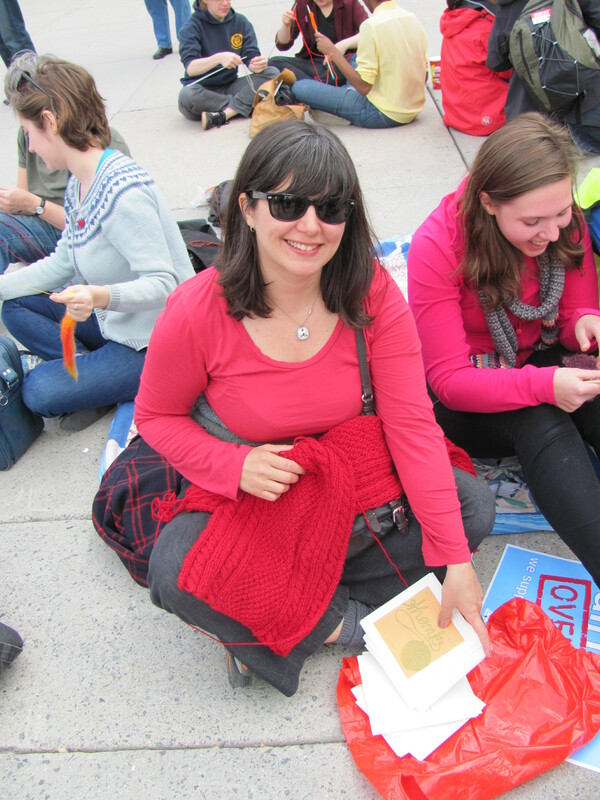 “Author and blogger Stephanie Pearl-McPhee, known on the web as the Yarn Harlot, was at the protest, knitting what she hoped would be a scarf” – The Sun. 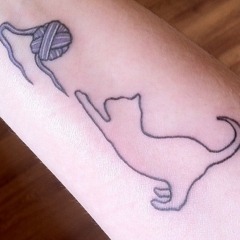 That’s knitting for ya, you just have to close your eyes, knit, and will your desired object into existence. You can never know for sure what you’ll get. 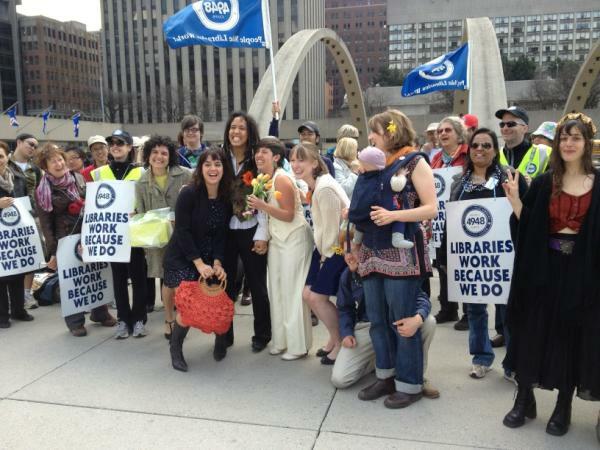 And then, that very night it was annouced that a tentative agreement had been reached. I like to think that the knitters helped turn the tide, thank you very much. And now, for your viewing pleasure, a photo gallery. 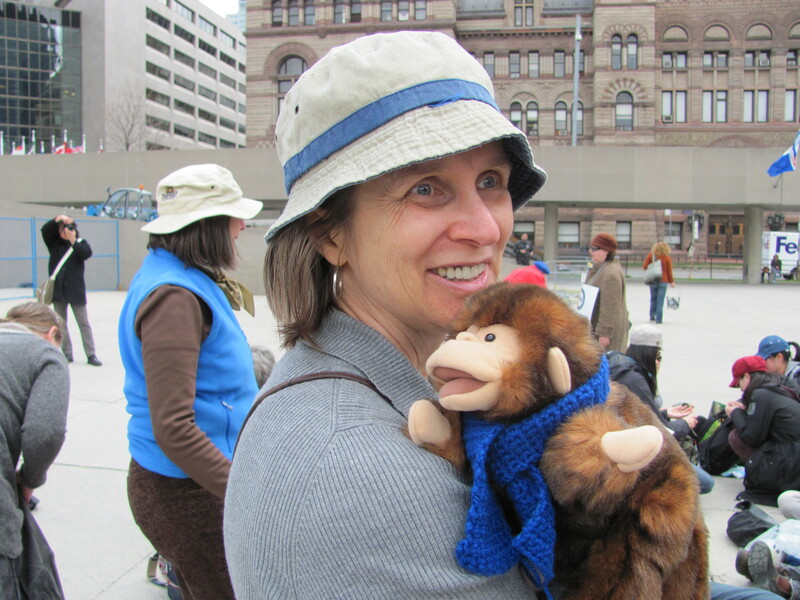 Childrens’ Librarians can’t help but bring their puppets to the picket line. This one got his own scarf out of the day! Katie with some of her gorgeous cable knitting and lino-cut cards she makes and sells around town as well as on her website. These ones are yarn themed! The woman just oozes creativity. This wedding party asked if they could have their picture taken with us! I can’t believe this happened in the 15 minutes I took for a coffee break. 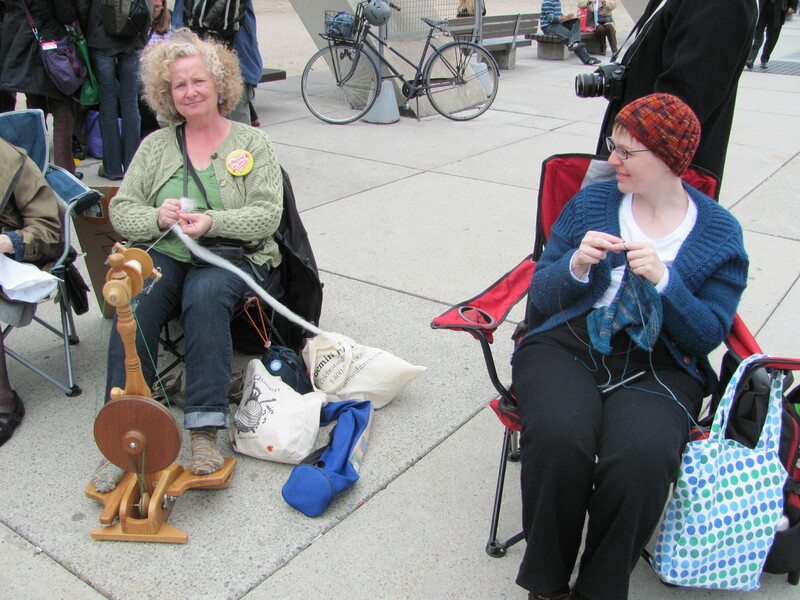 This entry was tagged activism, knitters, librarians, libraries, strike, wise hilda, work, writers, yarn harlot. Bookmark the permalink. 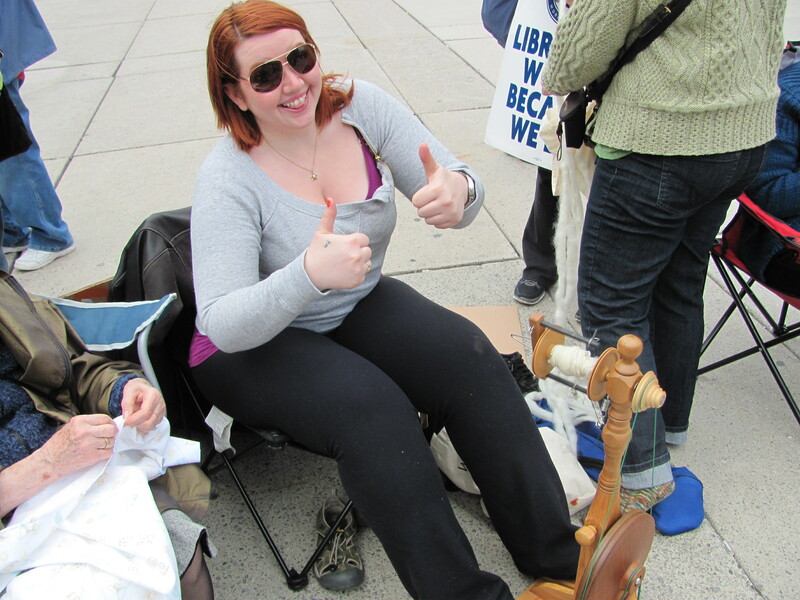 Thanks so much for putting this post together Erin ..what a wonderful record of this fun event! !